PLEASE SUPPORT THIS VERY IMPORTANT FILM AND SHARE WITH OTHERS! 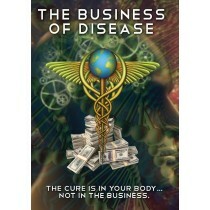 The Business of Disease is a seventy-four-minute documentary exploring the hypnosis of marketing, belief systems and the body’s ability to heal. The Business of Disease documentary exceeds the marketing of dis-ease but also examines the environmental and social programs from which our choices and experiences are shaped. It is an observation of how and why we have become catalysts for the business of disease. The film aims to provide options and insight into cutting-edge possibilities. Science is integrated as a means of opening the door to available possibilities in better understanding the inner technology of spirit, mind, and body. The documentary takes a “whole being” approach in dealing with dis-ease. This is a film that encourages us all to be unafraid to take responsibility for our bodies, our spirits and our minds. "Cast suspicion on Big Pharma"
"I think the film is very timely!" Foster Gamble, Producer of the film "Thrive"